We spent our first day mainly getting our bearings. I could not eat or drink anything other than pretzels and water, so we wandered the city with frequent bathroom and rest stops (ugh) and tried to enjoy the sights as much as possible. We were scared of ice (could my stomach suffering from one bug even begin to handle another assault?!) but it was impossible NOT to order a juice with ice, or a coffee with ice, because it was so smoldering hot out. Even most beers were served warm, alongside a small plastic cup of ice. So we said ‘ohh well’ and hopped for the best, refusing to give up cold beverages for the next 2.5 weeks. . . . or donuts. Leave it to my boyfriend to scout out the only donut vendor in Vietnam and stock up on a big pile for our trip ;) I don’t want to keep complaining, but it was a major bummer to be so ill in Hanoi, because the purpose of the city stop was to EAT. 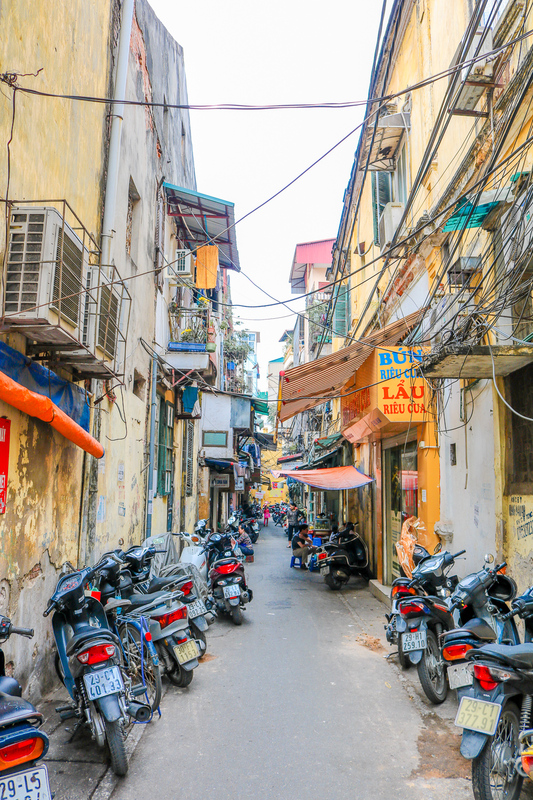 We’d planned multiple destinations in our Vietnam itinerary – some with the purpose of hiking, kayaking, or relaxing on the beach – but the main attraction we sought in Hanoi was the food. So I watched with sad eyes as Kai enjoyed noodles, smoothies, and egg coffees, while I stuck to my militant sick-stomach diet of pretzel sticks and H2O. 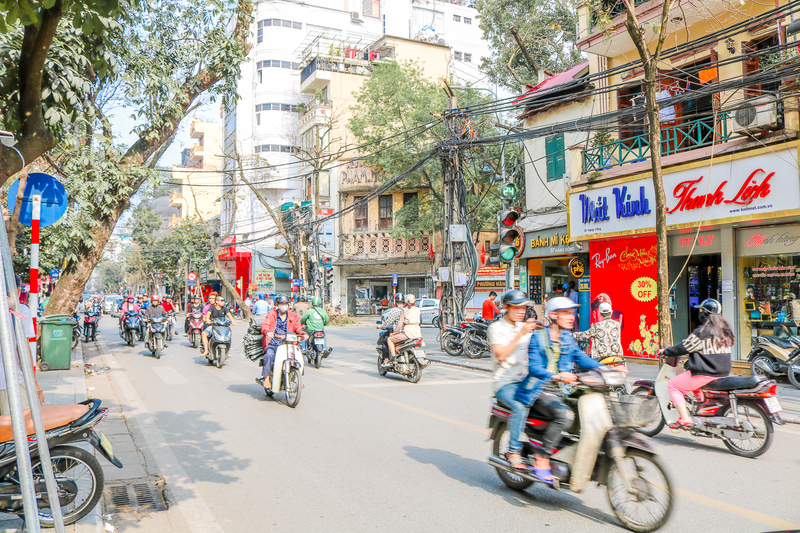 Luckily, we’d also mapped out a few fun activities in Hanoi that didn’t involve food, so I was able to experience the flavor of the city as well (just in a slightly different way!) On our first afternoon, after a quick power nap at our hotel, we walked around Hoan Kiem, which is a beautiful lake situated in the historical center of Hanoi. 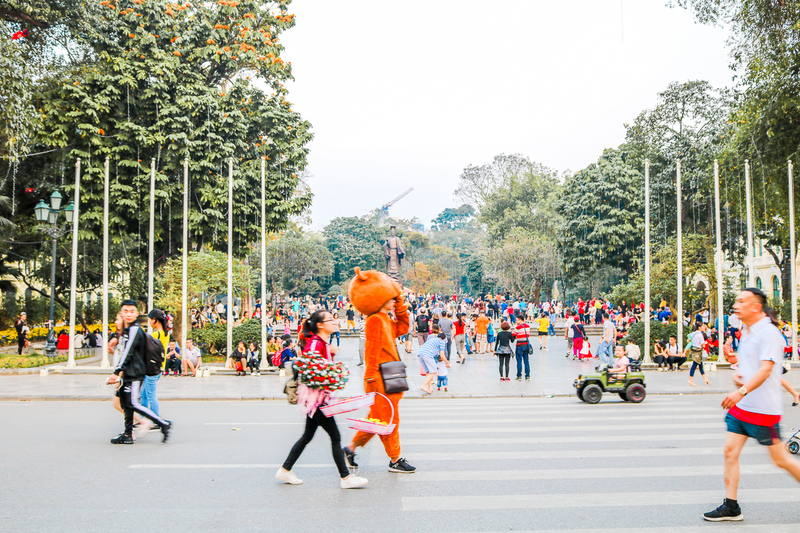 Hoan Kiem is clearly the social epicenter of Hanoi, with buskers, pottery painting, dancing, street artists, food stalls, shopping, entertainers, drinking, and people of all shapes and sizes getting in on the action! Like all of Hanoi, it was incredibly overwhelming to navigate, with so much new to smell, see, and do, but we found some small comforts reminiscent home (such as mint-chocolate ice cream, which Kai is treating himself to above!) that we could enjoy while simultaneously experiencing the new and unusual. I saw a man carrying his pet cat in a spaceship-like cat-carrier backpack. I watched couples dance to beautiful Vietnamese music in the middle of the street, and this little girl’s look of wonder below – just wow – I think her expression quite accurately sums up how I was feeling about the entire Vietnam experience thus far ;) After roaming around the lake for a bit (wait until you see this spot in the daytime!) We hit the spa. First favorite thing about Vietnam? You can usually score a bomb 30 minute massage for about $6. As Kai and I knew we’d be uber jet lagged, we wanted to do something on our first night that was unique, but also not super demanding. So we booked into a 3 hour couples spa package at SF Spa and were whisked away into another world – one that was quiet, relaxing, and just the break we (already!) needed from the bustling city. This was one of the more ‘expensive’ spas in the city, but was highly recommended by two friends who had gone to Vietnam a few months prior. And by expensive, I mean that for €150 total, we each had a 60 minute massage, a 30 minute body scrub, 15 minutes in the steam bath, 20 minutes soaking in a jacuzzi with milk and rose petals, a 60 minutes facial, dinner, and juice, all in a private, beautifully decorated room. Considering I normally pay €70 for a 60 minute massage in Amsterdam (no tip included!) 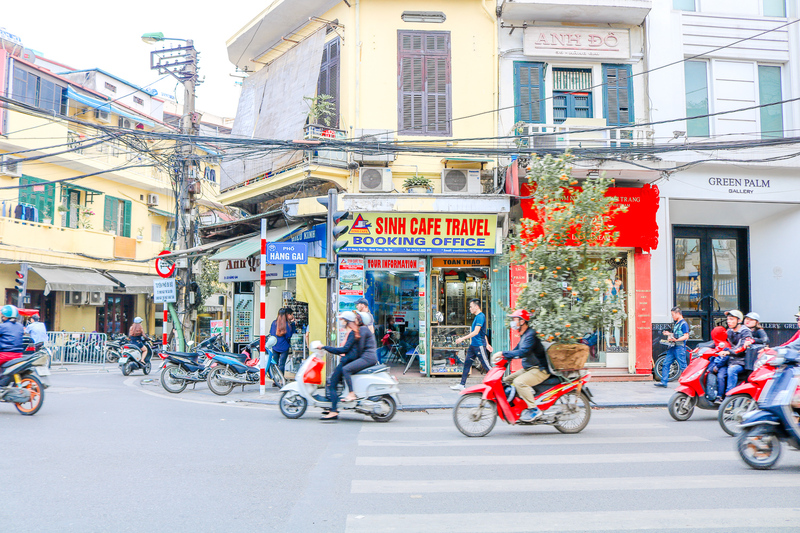 this package was beyond a steal, and although it was one of the more pricier activities we did while in Vietnam, it was worth every. single. penny. They staff was not only talented, but incredibly sweet, and upon hearing I was ill, made me a light fried rice for dinner, while Kai’s first proper Vietnamese meal consisted of summer rolls, sticky beef, and noodles, which we ate at a table, sitting on the floor, while decked out in our big fluffy robes. Yes, it was an evening for the books for sure! After our spa evening, we walked back to our hotel – which I realize I didn’t mention before – which was nearby in the old quarter. We booked all of the accommodation for our Vietnam trip on Booking.com (where I work and also get a sick discount). 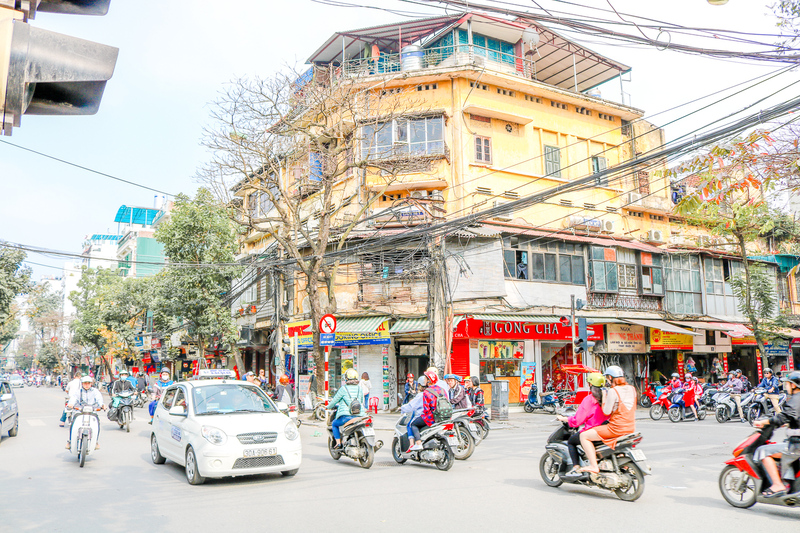 Looking back, we stayed at quite diverse properties – we booked a city center hotel in Hanoi, an overnight cruise in Ha Long Bay, a Homestay in Sa Pa, an Eco Beach Resort in Phu Quoc, and a five star luxury hotel in Ho Chi Minh City. 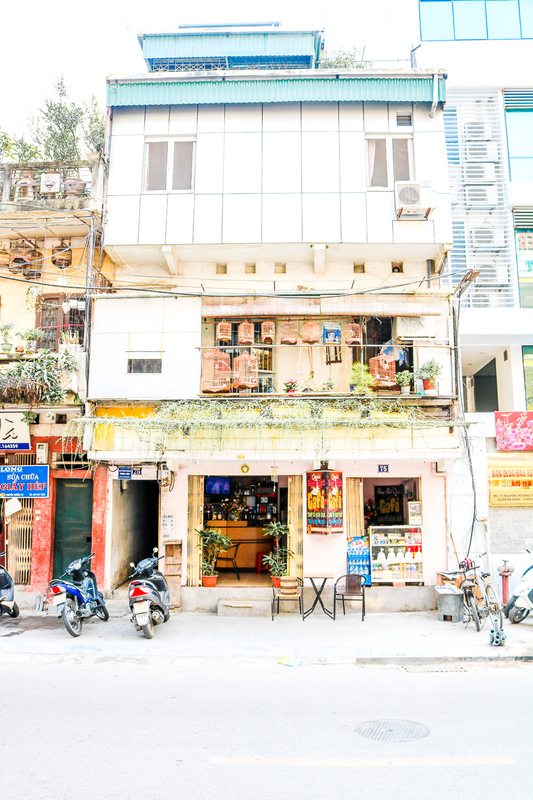 In Hanoi, our home base was The Light Hotel, which had a 9.0 on Booking.com and beautiful rooftop views, and was only €100 for two nights. Kai said the breakfast was fantastic (I slept every morning and missed it because of the stomach bug) and our room was big, although we didn’t have a window (lol). We also trashed it within 5 minutes of being there because we both brought big trekking backpacks, which are kind of hard to pick through and find what you’re looking for without piling everything out! So no photos of our room, but yes, we’d definitely recommend it! Day two in Hanoi was exciting, because I was almost – kinda – ready for real food! There are so many amazing fresh juice stalls in Hanoi and throughout Vietnam, and while I wasn’t quite ready to join Kai over pho for breakfast, I did kick off the day with a mango banana smoothie which was super lux after living on pretzels for three days! Also, as you can see above, most people in Vietnam sits on tiny chairs! I was amazed every time I saw a man or woman, 80 years plus, hunkered down comfortably on one of these little plastic seats. I turned to Google to help explain the small chair culture in Vietnam, and found two potential reasons for their popularity. One, I guess it’s illegal to sit on sidewalks in Vietnam (ha!! millions of people here are breaking the law?!) and the tiny chairs are easy to cart away quickly. Secondly, tall chairs are often associated with more money, so if you see tiny chairs, you know you’re going to get great, authentic, local food or service. Big chairs mean big restaurant bills, and are often more associated with restaurants for tourists, or those with more money. Not sure which – if either – of these explanations are true. But as we like to travel like locals, we fully embraced tiny chair culture while in Vietnam ;) Other than eating in Hanoi, we didn’t have much planned, but hampered by the bug, we decided to spend the morning of day two doing something cultural. The Temple of Literature was two miles from our hotel, so we thought, cool, let’s walk there! which turned into a hot and sticky mess as we dodged traffic and stumbled over dirt sidewalks and scooters, and after two water stops and one mile wound up calling an Uber which was $2. LOL. When we got there, we paid about a dollar to enter the gardens and area within the temple, and grabbed a guided booklet so we could read up on the background of the beautiful landmark. 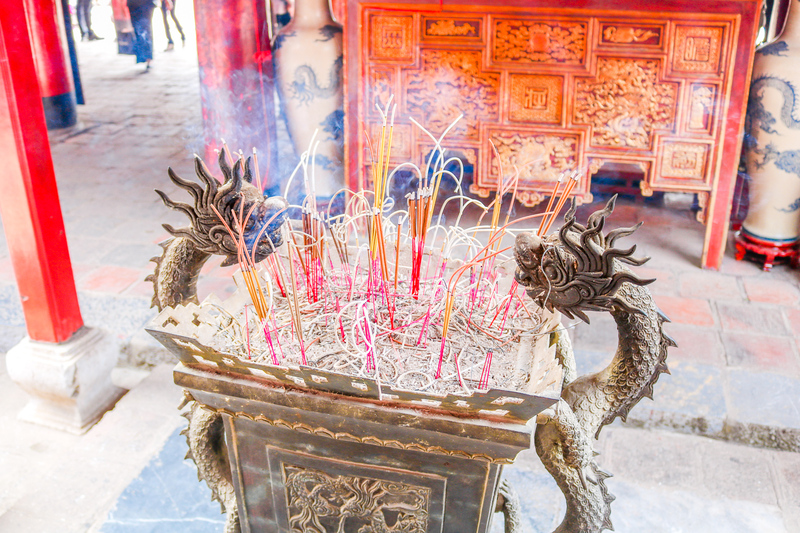 The temple was built in 1070 in the honor of Confucius, and is home to the Imperial Academy, Vietnam’s first national university. Which would explain why we saw several groups of students within the temple’s gardens, in their caps and gowns taking graduation photos! 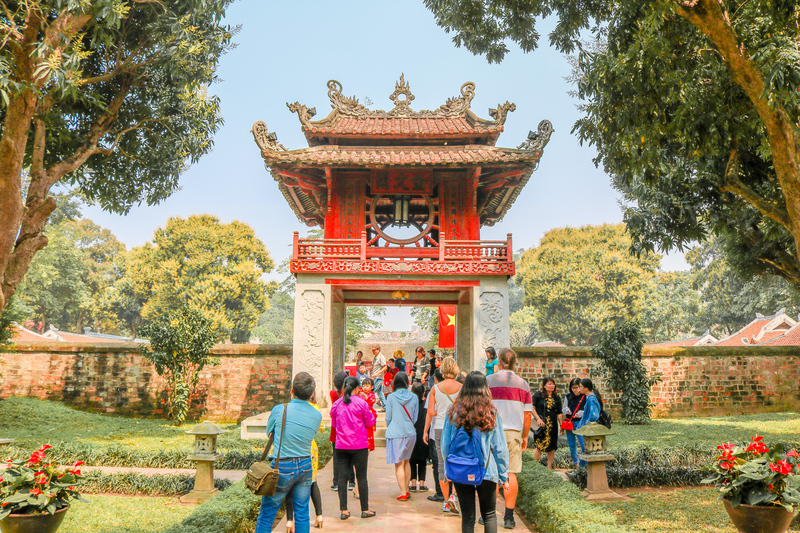 The temple gardens were actually quite peaceful, and thus began my mission for the day: uncover activities in Hanoi that allow for moments of solitude, so we could dip in and out of the chaos, while still experiencing Hanoi AND staying sane! Behind the photos: travel isn’t always beautiful temples and luxurious nights at the spa. Thanks to the mango banana smoothie I thought my stomach could handle earlier in the morning, I spent the rest of the day doubled over in pain. It was particularly bad right after we got out of the temple – I remember crouching down into a little ball on the sidewalk while waiting for our cab. Originally, we’d wanted to cycle around West Lake, a scenic lake and neighborhood area in the north of Hanoi with gardens, hotels and villas. 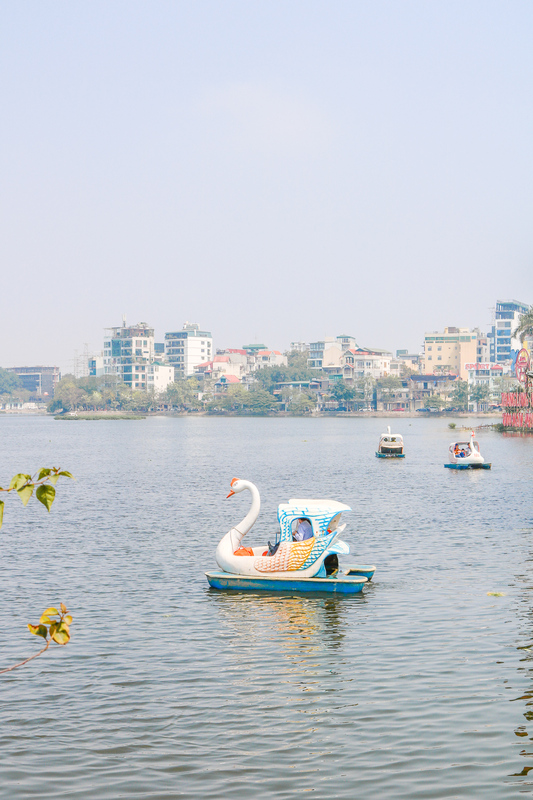 However, I really wasn’t up to the physical feat of cycling with a sore stomach in the heat, so we settled on renting (what we initially thought to be) swan boats in Truc Bach Lake, a smaller body of water adjacent to West Lake. 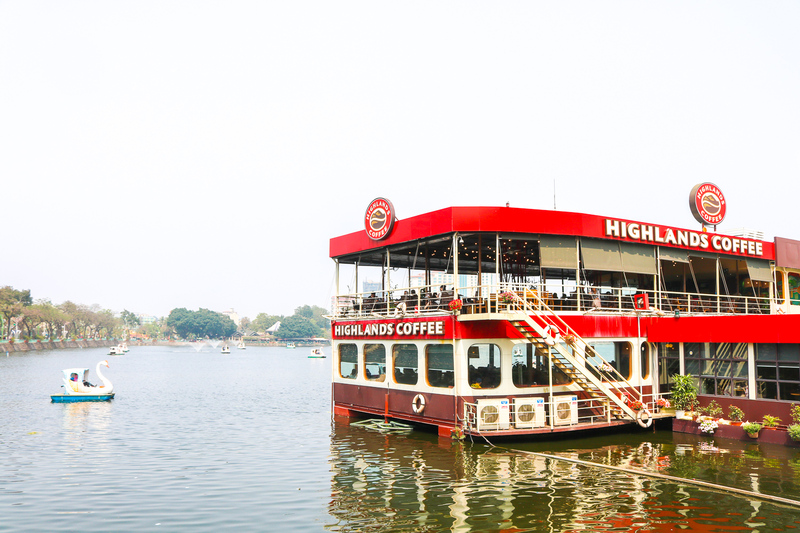 We stopped in a very nautical rendition of Highlands Coffee (Vietnam’s equivalent of Starbucks) which was located inside a big red boat, where Kai fueled up on caffeine before we rented our own smaller boat! 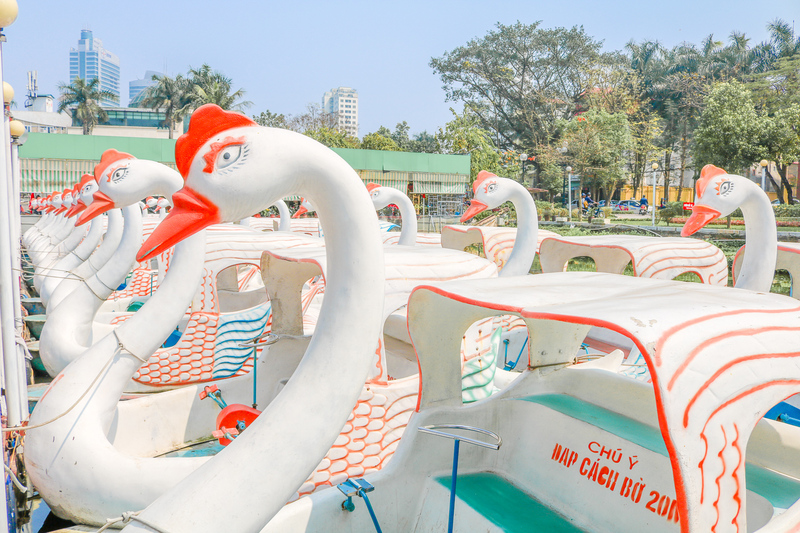 To be honest, these cute little paddle boats were just the kind of Hanoi activity I was hoping to find – they allowed us to experience the city and maintain a sense of calm and peace at the same time. And funny cultural moment – in Boston there are beautiful swan boats for rent in the gardens. And in Amsterdam, it’s not uncommon to see a big swan boat floating down the Amstel or one of the canals. From a distance, I assumed the boats here would also be swans, or at least ducks. But upon closer inspection it became apparent that in all actuality, we were about to hop on board a chicken! Kai, my healthy strong boyfriend, did most of the chicken boat paddling, while I snapped photos and took in the city around us. After all that paddling, Kai was hungry, so we walked over to Bún chả 34 at Hàng Than, where we were told we would find the best bun cha in the city! This next house gets two photos, because I was completely mesmerized by the sea of wire bird cages on the balcony. Imagine sipping coffee every morning on this balcony, surrounded by flowers and chirping birds! It took about a day and a half, but once we adjusted to the overwhelming rush of being in such a packed and disorderly city, the beauty of it all really started to hit us. But back to bún chả! Bún chả is a Vietnamese specialty that originates from Hanoi. The dish consists of crispy grilled pork, noodles, broth, fresh herbs, and hot chillies. This spot looked like a total hole in the wall, but I am convinced that it was here we had the best (paid) meal of our entire trip. I’ll elaborate on the nuances of the previous sentences in a later post, but just know that these noodles were so. freakin. good. We ordered two bowls, although I managed about three bites before I had to hand my dish over to Kai to finish up. Each serving came with a tall pile of grilled pork, swimming in a deep pool of spices and broth, a side of noodles, and a plate of herbs and diced chilies that we could add to the bowl as we pleased. The space was sticky and cramped, we sat on small plastic chairs at a shared table, dirty napkins and bottle caps were simply discarded by patrons on the ground, our beer was served warm, and to top off this list of oddities, I was still very sick to my stomach – and yet Bún chả 34 delivered the most delicious f***ing bowl of noodles I’ve ever had in my entire life! Our only regret was that they were out of spring rolls, the only other menu item, which we were told were also spectacular (sad trombone). After the meal, we walked back to our hotel (following an episode of ‘do I go to the hospital? !’ outside) and somehow, despite everything, the city felt even more magical at night. Rainbow colors fluttered everywhere, and the hour was quiet, as the majority of the city’s population were at home eating dinner, before the debaucherous evening hours hit. And that’s a wrap on Hanoi part one! Kai and I actually had a third day in Hanoi later in our trip (and a fourth as well! as the city was our base came for travels further north) but I’ll stick to chronological order and will share those photos later :) It’s a bummer I was sick, but thank goodness, the next day I woke up feeling better! And so I can’t wait to tell you about our cruise, where we not only ate a lot of amazing food, but also went squid fishing, kayaking, cave hiking, and slept amongst one of the world’s most beautiful bays. So much more on Vietnam to come! Previous PostPrevious Snow Day in Amsterdam!